Q: Would you introduce Diamond Age and the differences that you have with other supply companies in the armour area and your unique thought process in regards to design? 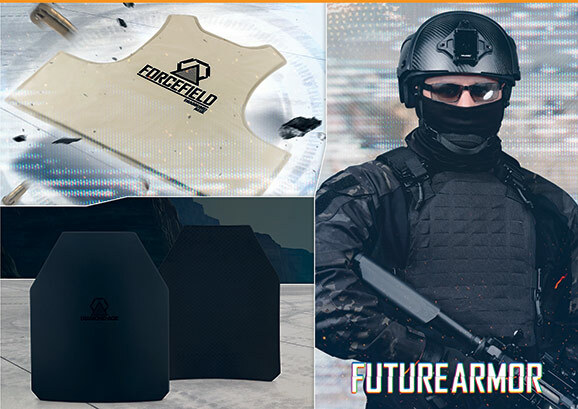 A: Diamond Age is two things: first, we’re an R&D firm that focuses on the identification and development of novel ceramic and metallic materials for anti-ballistic armor purposes. Second, we’re an industrial design studio that looks for the best ways to utilize those materials in armor systems. The materials R&D side of things is working towards complete vertical integration, in the sense that we even do our own raw material powder synthesis. We work from powder synthesis, to shaping and pressing, to densification, and then finally to characterization. We’ve now finalized two ceramic materials that are heading into production. The design studio has an entirely different role. It first asks: What’s causing casualties among our troops? Is it fragmentation from indirect fire? Fragmentation from IEDs? Concussive blast? Head shots that penetrate the helmet? Shots to non-covered areas of the head, neck, or face? Torso shots that penetrate soft or hard armor? Damage to arteries in areas not covered by body armor? Q: What projectiles are our troops facing on the battlefield? What’s the velocity and size distribution of the artillery, mortar and IED fragments that they can be hit with? How does body armor affect concussive blast waves? How does body armor affect mobility and one’s ability to conduct effective combat operations? A: With those questions answered and I think that we have a database of satisfactory answers, covering all conflicts since the Korean War, we design systems which are tailored to defeat the most likely threats, while keeping mobility and the needs of the infantryman in mind. Q: Moving on to products in use and already shipped, can we talk about the Bastion Helmet, its unique design and innovation that makes it multi use and in advance of other products? A: The Bastion was created to address one of the primary issues of ballistic protective headgear, namely that it’s ineffective against rifle rounds. Combat helmets offer protection from artillery/IED/mortar frag, from blunt force trauma, and from ricochets and glancing or very high obliquity projectile impacts, but are almost always perforated when struck by high-velocity rifle rounds, and this has always been the case, going back to the first steel helmets of WWI. But now, thanks to recent advances in ceramic armor and helmet shell construction, it’s possible to construct a lightweight helmet that stops virtually all common rifle threats. And we’ve gone ahead and done it. 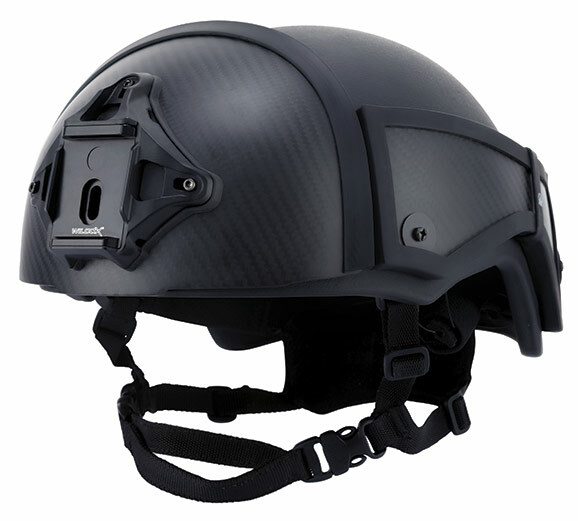 The Bastion is essentially an ultra-light, high-end combat helmet that’s up-armored with a modular ceramic shell. This exterior shell is comprised of five separate tiles: a front, a back, two sides, and a top. The tiles which comprise this shell are all individually removable and they can be mixed and matched to suit various tactical purposes. For instance, soldiers in turrets and those who perform SWAT-style breaching raids may want to wear a fully-ceramic-clad helmet, for maximum protection. Infantrymen who need better mobility may want to wear only the front and rear tiles. The front tile by itself can be used as a sort of sniper plate, which would look like a modernized version of the WWI German Stirnschild, the nearly six-pound steel plate that was used to up-armor sniper and machine-gunner helmets. In the Bastion’s case, the entire helmet with all plates weighs less than six pounds. And the front-tile-only configuration would weigh approximately three pounds. Which brings me to an interesting point: we’ve run a thorough epidemiological analysis and review, and it turns out that the front of the head – an area which corresponds with the extent of the frontal bone of the skull – is the point-of-entry for as many as 70-80% of casualties who are shot through the helmet. The area on the top of the head – which corresponds to the occipital bone – sees virtually no bullet entry wounds. As such, the front tile alone – which is of negligible weight – should offer very meaningful protection from firearm threats. We’ve tested the helmet against standard-issue assault rifle rounds such as the 5.56x45mm M855 and M193, the 5.45x39mm 7N10, the 7.62x39 Type PS Ball, and others, at muzzle velocity. The rounds are stopped, and backface deformation is nominal. We’ve also pitted the Bastion against small-caliber AP rounds, such as the 5.7x28mm SS190, which was stopped with virtually no backface deformation at all. Suffice it to say that all of the aforementioned rounds, at 0° obliquity and muzzle velocity, would have no trouble punching through an ACH. Ultimately, what we have is the first helmet to offer meaningful protection from rifle rounds, including steel-cored rifle rounds at muzzle velocity. And it’s not excessively heavy, thick, or unbalanced. Q: One product that caught my eye with the Bastion Helmet is the Paladin Armor System head-face-neck shield, can you talk through the design reasons and the safety implications? A: It’s not just the frontal bone of the skull that’s vulnerable: if you compare wound density to body surface area, it turns out that the face and the anterior neck are the two most vulnerable spots on the modern soldier’s body. This was noted in casualty surveys from Vietnam, Israel’s 1982 Lebanon War, OIF/OEF and elsewhere. And protecting the face and neck is a very difficult problem. The past 15 years have seen a number of solutions, which are all very similar: the combat helmet is fitted with a mandible (jaw) shield and a transparent visor, so that it looks something like a motocross helmet. As admirable as the efforts to field these mandible helmets have been, and I view them as extremely admirable indeed, there are three drawbacks that are inherent to the design. First, they don’t offer protection from rifle rounds or sufficiently fast-moving frag. Second, they interfere with shouldering and aiming a weapon. Lastly, the mandibles offer no neck protection – and, in fact, they only offer anterior protection, for they usually don’t protect the suprahyoid region of the lower chin, which is worth mentioning as frag, from IEDs in particular, often rises from a low angle. The Paladin armor system – which is still in working prototype stages, but will soon be available for fielding trials – is a patent-pending system which sidesteps a couple of those drawbacks by design. It’s a mandible and visor that isn’t connected to the helmet at all, but is supported by the armor carrier and by an integrated load-distribution system. The fact that its weight is supported by the body, and not the head and neck, allows us to use armor ceramics and high-strength alloys in its construction, so it is fully capable of stopping rifle rounds at muzzle velocity, and this level of protection covers the entire anterior neck, jaw, and lower face. For all that, the Paladin Armor System is not very heavy; our present model weighs less than four and a half pounds (2kg.) For comfort and convenience’s sake, it’s designed so that it can be raised and lowered with one hand. Q: I understand that your business is heavily engaged in materials science, research and development. Can you tell us more about that? A: The synthesis, research and development of armor materials is the foundation of our business. The vast majority of that effort is dedicated to ceramic materials, where we’re presently working with a number of candidates for further commercial development. The challenge here is to produce something that exhibits better performance than boron carbide, yet is still cost-competitive. So therefore, e.g., beryllium and scandium ceramics can immediately be ruled out, despite their excellent performance, on account of the very high cost of the elemental raw materials we’d need for their synthesis. Two of the candidates materials we’re working with are especially attractive on basis of performance and price, and our present efforts focus on scaling them up. In the longer run, we’re working on applying higher pressures to bear on raw materials – for there is great, and almost entirely untapped, potential in metastable high-pressure ceramic phases. These are ceramic compounds which can only be formed at very high pressures (typically around 2-6 GPa, roughly 300,000-900,000 psi,) but which are indefinitely stable when brought back down to atmospheric pressure post-synthesis. A whole new world of interesting oxides and nitrides, which are typically inexpensive to produce insofar as elemental raw materials are concerned, opens up at high pressure. For instance, it’s highly likely that the high-pressure boron subnitride B13N2 would outperform all of today’s armor ceramic materials by a wide margin. So the development and commercialization of bulk high-pressure materials is one area where we’re focusing our longer-term efforts, but it does demand significant investments in time and engineering. The bottom line is that we’re developing new armor materials to help lighten the load and enhance protection and survivability. This is the hard science of the business; the rest is design and craftsmanship.